For other uses, see Ramsgate (disambiguation). Ramsgate is a seaside town in the district of Thanet in east Kent, England. It was one of the great English seaside towns of the 19th century. In 2001 it had a population of about 40,000. Ramsgate’s main attraction is its coastline, and its main industries are tourism and fishing. The town has one of the largest marinas on the English south coast, and the Port of Ramsgate provided cross-channel ferries for many years. Ramsgate began as a fishing and farming hamlet. The Christian missionary St Augustine, sent by Pope Gregory the Great, landed near Ramsgate in 597AD. The town is home to the Shrine of St Augustine. 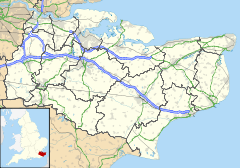 The earliest reference to the town is in the Kent Hundred Rolls of 1274-5, both as Remmesgate (in the local personal name of ‘Christina de Remmesgate’) and Remisgat (with reference to the town). The names Ramisgate and Raunsgate appear in the parish of St. Laurence records circa 1290. These are all derived from late Anglo-Saxon ‘Hremmes’ from earlier ‘Hræfnes’ (raven’s) and ‘geat’ (gate), with reference to the gap in the cliffs. In 1357, the area became known as Ramesgate. Ramsgate was a member of the Confederation of Cinque Ports, under the 'Limb' of Sandwich, Kent. The construction of Ramsgate Harbour began in 1749 and was completed in about 1850. The harbour has the distinction of being the only Royal Harbour in the United Kingdom. Because of its proximity to mainland Europe, Ramsgate was a chief embarkation point both during the Napoleonic Wars and for the Dunkirk evacuation in 1940. The architect A W Pugin and his sons lived in Ramsgate and built several important buildings there, including St Augustine's Church, The Grange, St Augustine's Abbey, and The Granville Hotel. The artist Vincent Van Gogh moved to Ramsgate in April 1876, at age 23. He boarded at 11 Spencer Square, which is identified by a blue plaque. He obtained work as a teacher at a local school in Royal Road, where he received his post. In one of his letters  to his brother Theo, he described his surroundings: "There’s a harbour full of all kinds of ships, closed in by stone jetties running into the sea on which one can walk. And further out one sees the sea in its natural state, and that’s beautiful." In 1901, an electric tram service, one of the few inter-urban tramways in Britain, was introduced on the Isle of Thanet. The towns of Ramsgate, Margate and Broadstairs were linked by 11 miles of track. In 1915–1916, early aircraft began to use the open farmland at Manston as a site for emergency landings. The location near the Kent coast gave Manston some advantages over the other previously established aerodromes. During the First World War, Ramsgate was the target of bombing raids by Zeppelin airships. By 1917 the Royal Flying Corps was well established and taking an active part in the defence of Britain. As RAF Manston, the aerodrome played an important role in the Second World War. It is now called Kent International Airport, but is currently not operational. In October 1939, the Royal Navy established a Coastal Forces base at Ramsgate called HMS Fervent, which operated Motor Torpedo Boats, Motor Gun Boats and Motor Launches until September 1945. From 27 May 1940, Ramsgate harbour was the main assembly point for the build-up of small craft needed for Operation Dynamo, the evacuation of the British Expeditionary Force from Dunkirk. Once the evacuation was under way, Ramsgate became the second-busiest port after Dover, and just under 43,000 men passed through the port, transported onwards by 82 special trains. Ramsgate is located 78 miles from central London in an east south-easterly direction at one of the most easterly points of the United Kingdom (the furthest point east is Lowestoft in Suffolk). The town is an amalgamation of two settlements: a fishing community on the coast in the shallow valley between two chalk cliffs, and an inland farming community that is now the Parish of St Lawrence. The cliffs are known as the East Cliff and the West Cliff and are predominantly residential areas. There are promenades along both cliff tops with parks at either end and sandy beaches on the coast. Ramsgate has an oceanic climate (Köppen climate classification Cfb) as is typical in the United Kingdom; the nearest Met Office weather station for which data is available is Manston Airport, about two miles west of the town centre. The highest temperature ever recorded is 34.6 °C (94.3 °F) in August 2003, though typically the warmest day of the year averages 28.5 °C (83.3 °F) and 8.8 days will record a temperature of 25.1 °C (77.2 °F) or above. The lowest recorded temperature is -14.5 °C (5.9 °F), in February 1986, though typically the coldest night of the year averages -6.2 °C (20.8 °F). A total of 26.9 days of the year should record an air frost. Rainfall averages around 600 mm per year, a figure similar to that for the driest parts of England. Over 1 mm of rain can be expected on 106.6 days. Averages refer to a mixture of the 1971-2000 and 1981-2010 climate periods. Being close to the coast, and in Southern England, sunshine compares favourably with most of the United Kingdom, at over 1800 hours a year. Only the Sussex coast tends to be notably sunnier, although much of the remainder of the south coast receives a similar amount of sunshine as Ramsgate. Ramsgate is in the parliamentary constituency of Thanet South, which is represented by Conservative MP Craig Mackinlay. He won the seat in the 2015 general election, representing a Conservative hold after Laura Sandys won the seat for the Conservatives in the 2010 General Election. Before 6 May 2010, the MP for Ramsgate was Stephen Ladyman, a Labour minister; he was preceded by Jonathan Aitken. Ramsgate was incorporated as a municipal borough in 1884. This was abolished in 1974, since when Ramsgate has been part of the Thanet local government district. The town is made up of seven electoral wards: Central Harbour, Cliffsend and Pegwell, Eastcliff, Nethercourt, Newington, Northwood, and Sir Moses Montefiore. These wards have seventeen of the fifty-six seats on the Thanet District Council; since the 2011 local elections fifteen of those seats have been held by Labour and two by the Conservative Party. Currently the council is run by a UKIP majority. Following a successful campaign by local activist Gerry O'Donnell, a town council was established for Ramsgate in June 2009. The Town Mayor of Ramsgate is currently Councillor Trevor Shonk. Ramsgate's main industries are tourism and fishing. The town has a thriving marina with over 800 moorings and a range of marine-related businesses that operate in the renovated arches under Royal Parade. Colleges in the town also cater for students of English as a foreign language. Although Ramsgate has the most valuable fish landings in Kent (~£700,000 in 2003), the fishing industry is in decline. The Port of Ramsgate has provided cross-channel ferries for many years. Previously, Sally Ferries UK provided a passenger and car ferry service to Dunkirk. Until April 2013, Transeuropa Ferries operated a freight and car ferry between Ramsgate and Oostende. Unemployment in Thanet stands at 4.1%; this is higher than the national average (2.5%). There is some light industry in the town. An emerging industry is power generation, with 800 jobs expected to be created by the Thanet offshore wind project, a wind farm just off the coast. Ramsgate market is held in High Street, King Street and Queen Street every Friday and Saturday. Ramsgate has a LETS scheme (RAMLETS) which was set up in 2014 enabling residents to trade goods and services using the virtual currency RAMs. It is working with the Newington Wellbeing Network to improve the lives of people living in the Newington ward of Ramsgate. According to the 2001 UK census, Ramsgate has a population of 39,639. The ethnicity of the town was 98.0% white, 0.8% mixed race, 0.3% black, 0.3% Chinese, 0.4% other Asian and 0.1% other ethnicity. The place of birth of residents was 95.6% United Kingdom, 0.7% Republic of Ireland, 0.6% Germany, 0.6% other Western European countries, 0.3% Eastern Europe, 0.6% Far East, 0.5% Africa, 0.3% North America, 0.3% South Asia, 0.2% Middle East, 0.2% Oceania and 0.1% South America. Religion was recorded as 71.6% Christian, 0.3% Muslim, 0.1% Hindu, 0.3% Buddhist, 0.1% Sikh and 0.1% Jewish. 17.9% were recorded as having no religion, 0.3% had an alternative religion and 7.1% didn't state their religion. For every 100 women, there were 91.2 men. The age distribution was 6% aged 0–4 years, 16% aged 5–15 years, 5% aged 16–19 years, 31% aged 20–44 years, 24% aged 45–64 years and 18% aged 65 years and over. Ramsgate's main attraction is its coastline, particularly Ramsgate Main Sands, which was awarded a Blue Flag in 2015. Ramsgate's wartime deep shelter tunnels are open to the public for tours, which have been running since 2014. Ramsgate town has a small population of feral rose-ringed parakeets. The story about them appearing in Ramsgate still remains a mystery. According to some sources they may have run away from the trading ships coming from British India in 1800s. The local council publishes a website specifically aimed at tourists visiting Ramsgate and neighbouring towns. There is an annual regatta event based at Ramsgate during the summer. Ramsgate carnival is an annual parade that takes place during the summer. Other events include the annual Addington Street Fair and the French Market. Ramsgate’s main football club, Ramsgate FC, plays in the Isthmian League Division One South. The local rivals of the club are Margate FC, situated 4 miles away. When the two teams meet, it is known as the Thanet derby. Ramsgate FC run a reserves team, which plays in the Kent Football League Second Division, and a women’s team, which plays in the South East Counties Women’s League Kent County Division. Ramsgate FC run five youth teams; the under-13 to under-18 teams compete in the Valley Express Kent Youth League, and the club also runs Ramsgate Youth U7 to U16, which play in the Molten East Kent Youth League. Two other youth teams in Ramsgate are Trinity and Hugin Vikings; both play in The Molten East Kent Youth League. Thanet Wanderers is the island’s only rugby team and has played at London Division 1 level, achieving its best result by defeating Doncaster at Twickenham in the final of the Intermediate Cup in 1997. The club runs five senior sides and many junior teams, all of which play at St Peter's. Cliftonville Hockey Club plays its home matches at St Lawrence College and has a clubhouse that it shares with Broadstairs Cricket Club. Thanet Galaxy is a Pan Disability Football Club that provides structured coaching for male and female footballers of all ages who qualify within the nationally and internationally recognised Pan Disability categories. The club trains at Chatham House Grammar School and plays in Kent Disability Football League in three age bands: U-11, U-16, and 16+. In their first season (2008/2009), the adult A team won the Kent Disability League Adult Championship. Ramsgate’s sports facilities include a public swimming pool, and a fitness centre with a gym and sports hall. Tennis clubs can be found at Spencer Square and St Laurence. Ramsgate has three golf clubs: St Augustine's, Stonelees, and Manston. There is also a sailing club, the Royal Temple Yacht Club, which is steeped in yacht-racing history and hosts racing throughout the year for a variety of historic trophies. The highlight of the season is the annual international sailing regatta, known as 'Ramsgate Week', which is usually held in August. The Gallery IOTA (Isle Of Thanet Arts) was based on the towns west cliff but is now on the harbour front. Ramsgate Maritime Museum near the harbour quayside has exhibits showing the evolution of Ramsgate Harbour and east Kent maritime history. One of Ramsgate's cinemas and theatres is the Granville Cinema, situated on Victoria Parade, in the town's Eastcliff area. The King's Theatre is situated near the town centre and offers shows, community events and a seniors' club every Monday. Talks on Ramsgate's history are frequently held there. Ramsgate has two paid-for newspapers, the Isle of Thanet Gazette and Thanet Times, both of which are owned by Northcliffe Media. Free newspapers covering the town include the Thanet Extra, part of the KM Group; and yourthanet, belonging to KOS Media. The local radio stations are KMFM Thanet, owned by the KM Group, community radio station Academy FM (Thanet), and the county-wide stations Heart Kent, Gold and BBC Radio Kent. Thanet Community Radio (TCR  offers an online arts- and features-based service for Thanet District and the surrounding area where people can listen to podcasts of local interest. The service works closely with Dover Community Radio. The Hugin Viking longship in Pegwell. The Hugin is a reconstructed Viking longship located at Pegwell Bay in Ramsgate. It was a gift from the Danish government in commemoration of the 1500th anniversary of the legendary arrival of conquering brothers Hengist and Horsa to England in the year 449. There are many Regency and Victorian buildings in Ramsgate. In all, there are 900 listed buildings in the town with more than 200 in the vicinity of the harbour. One of the town's most notable buildings is the 18th century Townley House designed by Mary Townley. The town has three notable churches. The first building used for worship in the Thanet parish of 'St Lawrence' was at St Laurence-in-Thanet; it was built in 1062 and rebuilt during the following centuries with the most significant changes made in the 16th century. Note the difference in spelling between the village of St Lawrence and its church, which is dedicated to the Roman Martyr Laurence. The second notable church is St Augustine's, which is situated on the town's West Cliff. It was designed by Augustus Pugin in 1847 in the Gothic Revival style. Its dedication commemorates Augustine, the first Archbishop of Canterbury, who landed at Ramsgate in AD 597 bringing Christianity to Britain. In March 2012 the church was designated a shrine to St Augustine of Canterbury; this ended a five-century absence of a shrine to St Augustine, as the original (at St Augustine's Abbey, Canterbury) had been destroyed during the Reformation. Thirdly, the town's parish church of St George is situated just off the High Street. Its lantern tower was added at the request of Trinity House as a navigational aid to passing ships and looks over the town. The ground was consecrated on 23 October 1827. St Augustine's is part of the Roman Catholic Archdiocese of Southwark, whilst St Laurence and St George are both Church of England and serve the Anglican community as part of the Diocese of Canterbury. Christ Church, built in 1847, also serves the Anglican community. Ramsgate library was originally built and paid for by Andrew Carnegie in 1904. On the evening of Friday 13 August 2004, it was destroyed by fire just two months short of its 100th anniversary. Though suspicions were raised about the causes of the fire, due to a similarly timed fire at the town's registry office, an investigation was unable to establish how the fire had started. Shortly after the blaze, planning permission was granted for a new library. The library has now been fully restored, and was officially re-opened on 20 February 2009. The Port of Ramsgate has a 700 berth marina, Royal Harbour Marina, and a ferry terminal built on reclaimed land. The harbour provides shelter from the effects of storms. The Goodwin Sands are nearby. In 2005, the marina had 12,000 visiting boats. Transeuropa Ferries passenger (with vehicle only) and freight ferries sailed until April 2013 to the Port of Ostend in Ostend, Belgium. The Port of Ramsgate has its own road access tunnel from outside the town, avoiding town centre congestion. The Royal National Lifeboat Institution's Ramsgate Lifeboat Station is in Ramsgate Harbour. Ramsgate is connected to the national road network primarily through the A299 Thanet Way, which continues on to the M2/A2 for the M25 (approx 1 hour) and London. The A256 provides a link to Dover and onwards to the A20 for the Channel Tunnel. Bus services are provided by Stagecoach South East and also serve Broadstairs, Canterbury, Sandwich and Margate. Ramsgate railway station is situated at the top of the town near the parish of St Lawrence. A new high-speed service to London St Pancras started in December 2009, running on High Speed 1, the UK’s first high-speed rail line, between London and Kent. The journey time from Ramsgate to St Pancras is 76 minutes. In March 2015, it was announced that journey times between Ramsgate and London St Pancras are expected to be reduced to 63 minutes in 2019, due to infrastructure enhancements. Other trains run from Ramsgate to London Charing Cross and London Victoria. Commuting time to the capital on these lines is approximately 1 hour 50 minutes. Trains from Ramsgate are routed via Margate, Chatham and Bromley South, or via Canterbury West or Dover Priory and Ashford International. Ramsgate railway station is operated by Southeastern who operate all services. A municipal airport was opened on 1 July 1935, operating until World War II broke out in 1939. Following a short spell as a satellite of RAF Manston, it closed in 1940. The airport was re-opened in 1952 and operated until closure in 1968. The town is situated directly under the flight path of Manston Airport. From September 2004 to August 2005 a low-cost airline EUjet operated frequent flights to many European destinations, replacing a large freight operator. However, flights were suspended after the collapse of its parent company, PlaneStation Group plc. Manston was sold to Infratil on 26 August 2005. Until May 2014, KLM Cityhopper operated two daily passenger flights from the airport to Amsterdam Airport Schiphol in the Netherlands. The airport was regularly used by freight operators such as Cargolux and Meridian. The airport was sold to Ann Gloag in November 2013. She was reported to be seeking a buyer, but her spokesman reported that a buyer had not been found, and the airport closed on 15 May 2014. Ramsgate's nearest college is East Kent College. This is situated in the nearby town of Broadstairs. There is also a campus for Canterbury Christ Church University in Broadstairs, which is within very easy reach of Ramsgate. There is also a sixth form at Chatham and Clarendon Grammar School, and St. Lawrence College, which are the only two sixth forms in the town. Ramsgate lifeboat station Provides an inshore boat and an offshore boat. ^ Ltd, Hudson Berkley Reinhart. "Ramsgate". Ramsgatetown.org. ^ "Town population 2011". Neighbourhood.statistics.gov.uk. Retrieved 2 October 2015. ^ "Welcome - Shrine of St Augustine, Ramsgate". Augustineshrine.co.uk. Archived from the original on 11 September 2016. Retrieved 21 August 2016. ^ "Kent Hundred Rolls Home". Kentarchaeology.ac. Retrieved 5 November 2018. ^ Encyclopedia.com: OED etymology of "raven"
^ "RM07 (-, ): To Theo van Gogh. Ramsgate, April-May 1876. - Vincent van Gogh Letters". Vangoghletters.org. Retrieved 21 August 2016. ^ "077 (075, 61): To Theo van Gogh. Ramsgate, Monday, 17 April 1876. - Vincent van Gogh Letters". Vangoghletters.org. Retrieved 5 November 2018. ^ "Zeppelin Raid 1915". Web.archive.org. 25 August 2011. Retrieved 5 November 2018. ^ "Dunkirk Evacuation and Trains - History Learning Site". Historylearningsite.co.uk. Retrieved 21 August 2016. ^ "2003 Maximum". Eca.knmi.nl. Retrieved 1 March 2011. ^ "Annual average warmest day". Eca.knmi.nl. Retrieved 1 March 2011. ^ "Average >25c days". Eca.knmi.nl. Retrieved 1 March 2011. ^ "1986 Minimum". Eca.knmi.nl. Retrieved 1 March 2011. ^ "Annual average coldest night". Eca.knmi.nl. Retrieved 1 March 2011. ^ a b c d e "Climate Normals 1981–2010". UK Government. January 2018. Retrieved 20 January 2018. ^ "Climate Normals 1971–2000". KNMI. Retrieved 1 March 2011. ^ "Council & Democracy". Thanet District Council. Archived from the original on 23 February 2012. Retrieved 27 July 2011. ^ Ltd, Hudson Berkley Reinhart. "New Mayor of Ramsgate". Ramsgatetown.org. Retrieved 21 August 2016. ^ "Kent Coastal Network" (PDF). Archived from the original (PDF) on 26 September 2007. Retrieved 20 December 2006. ^ "Unemployment figures for February 2006, Thanet District Council". Archived from the original on 27 September 2006. Retrieved 8 December 2006. ^ "Markets". Web.archive.org. 27 September 2006. Retrieved 5 November 2018. ^ a b c d e "Neighbourhood Statistics". Statistics.gov.uk. Archived from the original on 25 May 2011. Retrieved 29 March 2007. ^ "Beaches in Thanet and Cornwall top Blue Flag cleanliness standards". BBC News. 20 May 2015. Retrieved 21 August 2016. ^ "Beaches2". Blueflag.global. Retrieved 21 August 2016. ^ Phil Spain. "Ramsgate Tunnels". Ramsgatetunnels.org. Retrieved 21 August 2016. ^ "Exotic green winged aliens will be the focus of new research". kentonline.co.uk. 13 February 2014. ^ "Ramsgate Week 2017 - the Royal Temple Yacht Club annual regatta in Ramsgate, Thanet, Kent". Ramsgateweek.com. Retrieved 21 August 2016. ^ "Cliftonville Hockey Club". Retrieved 16 March 2013. ^ "Leisureforce.co.uk". Archived from the original on 1 September 2006. Retrieved 6 December 2006. ^ "Leisureforce.co.uk". Archived from the original on 6 May 2007. Retrieved 6 December 2006. ^ "Welcoming golf course near Ramsgate; club house, pro-shop". staugustinesgolfclub.co.uk. Retrieved 5 November 2018. ^ "Stonelees Golf Centre, Ramsgate, Kent". Web.archive.org. 15 December 2006. Retrieved 5 November 2018. ^ "Manston Golf Centre". Manstongolf.co.uk. Retrieved 5 November 2018. ^ "Welcome to Royal Temple Yacht Club". Rtyc.com. Retrieved 21 August 2016. ^ "IOTA Home". Iota-arts.org.uk. Retrieved 21 August 2016. ^ "Thanet Community Radio Signature". Thanetcommunityradio.co.uk. Retrieved 5 November 2018. ^ Paul Nettleingham, "Townley House in Ramsgate", Michaels Bookshop Ramsgate. Retrieved 15 March 2012. ^ "Arson inquiry after library fire". BBC News. 16 August 2004. Retrieved 24 June 2013. ^ "Ramsgate Library's rebirth Trusted article source icon". Thisiskent.co.uk. 13 January 2009. Archived from the original on 24 June 2013. Retrieved 24 June 2013. ^ "Trains to Kent Seaside - Southeastern". Southeasternrailway.co.uk. Retrieved 5 November 2018. ^ "Kent rail link to London to speed up with £12m investment". BBC News. 13 March 2015. Retrieved 21 August 2016. ^ "Airline goes into administration". BBC News. 26 July 2005. Retrieved 22 May 2010. Wikimedia Commons has media related to Ramsgate. This page was last edited on 18 April 2019, at 08:53 (UTC).